Independence Day is almost here! Nextdoor, an app that works as a social media network for neighborhoods, surveyed over 3,000 people across 44 major cities to see how the average American celebrates. No surprise here - 37 percent of people who took the survey said that they'll celebrate the 4th of July with fireworks, making it the most popular way to commemorate our nation's independence. 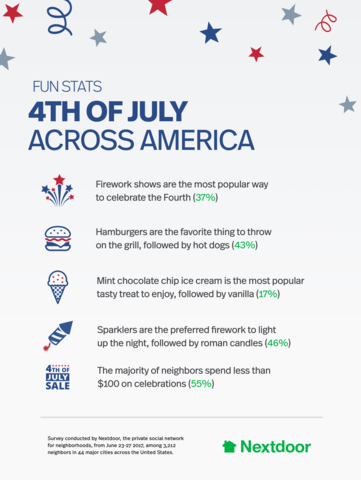 46 percent said that sparklers are their preferred firework of choice, followed by Roman candles. Moving onto foods, hamburgers are America's favorite thing to throw on the grill at 43 percent. Hot dogs came in second place. And for dessert, 17 percent said that mint chocolate chip ice cream is their favorite flavor. Vanilla ice cream was the runner-up. Lastly, most families are relatively thrifty when it comes to 4th of July celebrations. 55 percent said that they plan on spending less than $100 for the holiday.